Stakeholder relationships are changing for museums. NPQ has covered how institutions from New Orleans to Houston are reimagining how they show up in their communities and even who their communities are. A Smithsonian institution engaged in curating the present when it displayed symbolic objects from ongoing protests. After decades of almost universally white leadership, some museums have made serious efforts to develop strategic plans to develop more diverse staff and boards. The things that have historically put museums on the proverbial map—huge collections, grand buildings, famous names—are losing ground to audience engagement, innovative displays, and community representation. There is one particularly prominent way in which museums are still far behind where they could be, and that is in facing their colonial pasts and the large parts of their collections that were stolen from communities of color. This week, several protests at different institutions signaled the decreasing levels of tolerance for behavior that does not acknowledge the debt museums owe to those communities. 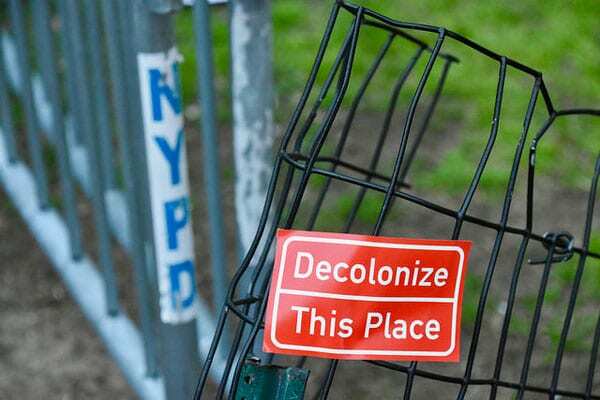 In New York, a group called #DecolonizeThisPlace went to the Brooklyn Museum to protest and draw attention to the works acquired through imperial plunder. They wrote, “We are sharing our experiences about blurring the lines between art, activism and how we live.” DTP has been to the Brooklyn museum before, most recently to protest the hiring of a white woman to curate the African art collection. The museum’s security shepherded them out of the building, saying, “This is completely not related to what we have here,” but DPT handed out flyers, took photos, and made their message known. This recently aired knowledge about Mr. Kanders’ business is demonstrative of the systemic injustice at the forefront of the Whitney’s ongoing struggle to attract and retain a diverse staff and audience…We cannot claim to serve these communities [of color] while accepting funding from individuals whose actions are at odds with that mission [of equity and representation]. Museum director Alan Weinberg responded by saying that museums were “a safe space for unsafe art”—but of course, in this case, the art is not the point. Weinberg argued out that the museum has “present[ed] progressive and challenging artists,” as if presenting progressive artists—something the museum should be doing as a matter of course—somehow balances the moral scales against profiting from the violence perpetrated on people of color at the border, some of whom are fleeing situations created by the same imperialistic dynamic that also permitted the looting of artifacts for museum collections.